Over the past few years, iOS devices have become one of the most important portable devices in the world. Approximately more than half of people around the world currently take iOS devices as their habit for daily life, and that number is growing. Since there is such a vast range of activities iOS devices are able to perfectly cover, knowing more ways to organize the data in your iOS devices can definitely make everything a lot easier for you. So let’s take transferring music from iPad to iTunes for example to get to know how to organize your information. Designed by Apple, iTunes serves as an iOS data management tool for users to organize their data efficiently. However, only the purchased items can be shared via iTunes, which makes iTunes less than a perfect choice. Anyway, it is not time-wasting to take a few minutes learning how to transfer purchased items from iPad to iTunes manually. Step 1: Open iTunes. Choose “Edit > Preference > Devices”. 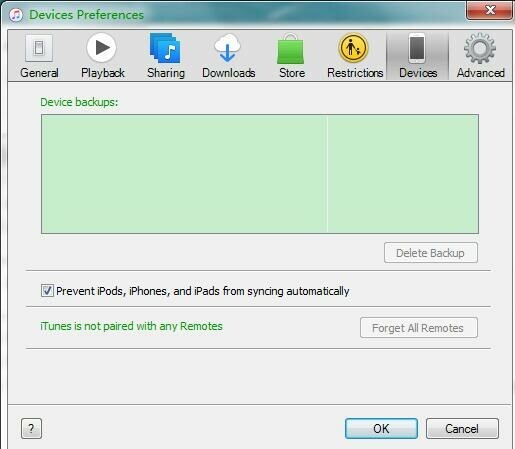 Check the box besides “Prevent iPods, iPhones, and iPads from syncing automatically”. Click “OK”. Step 2: Connect your iPad to your computer with USB cable. Open iTunes. Choose “File > Devices > Transfer Purchases from iPad”. This is how to transfer purchased items from iPad to iTunes manually. Originally created by Apple, iTunes Store is designed for offering apple users huge catalogs to let you enjoying music and other entertainments more conveniently and freely. Follow me to see how to transfer purchased items from iPad to iTunes library via iTunes Store. Step 1: Open iTunes. Choose “Account > Sign In”. Step 2: In the pop-up window, enter your Apple ID and password you are using on your iPad to sign in to your iTunes Store. Click “Sign In”. Then all of your data in iTunes Store on your iPad will be automatically synced to iTunes. Now you know how to transfer purchased items from iPad to iTunes library via iTunes Store. With iTunes, there are two ways like above to transfer purchases, however, if you want to transfer non-purchased items from iPhone/iPad to iTunes, you could only rely on 3rd party software like iTransfer. Perhaps you have been getting used to organizing your data via iTunes or iTunes Store. Either way, you probably experienced some inconveniences holding you back. For example, you cannot transfer non-purchased items via iTunes. 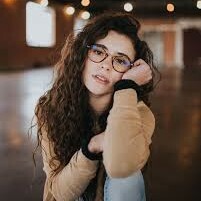 So you are looking for a better choice to make it easier for you. By now you have probably heard many iOS management tools tossed around by all kinds of websites and still feel lost. If that is the case, please allow me to introduce this amazing tool for you. One of the reasons that Leawo iTransfer has become such a wonderful iOS management tool is that it is perfectly good at organizing your iOS data safely and simply. Nobody likes to get involved in any complicated procedures. Simplicity is what everyone is looking for, which is exactly what Leawo iTransfer can offer you. In the very first time when you launch Leawo iTransfer, you will know where to start to get it work even if the technical skills are out of your league. 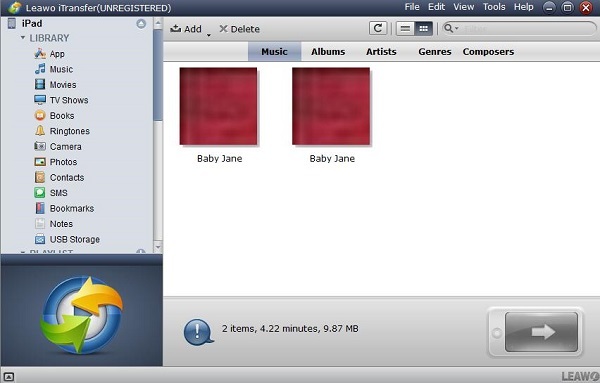 Supporting various file formats, Leawo iTransfer allows you to transfer and back up your data like music, videos between iOS devices and PC/Mac without effort. You don’t need the internet connection to support Leawo iTransfer. A computer is all you need to prepare. So let’s cut to the chase. I am going to guide you go through the way on how to transfer non-purchased items from iPad to iTunes via Leawo iTransfer. By the time you adsorb the details, you’ll feel the efficiency you have never felt before. Connect your iPad to your computer with USB cable. You can easily find the trial version on the official site and decide whether to purchase the professional version or not. Download and install Leawo iTransfer on your computer. Open it and then you can see all of the information on your iPad can be simply scanned. Choose “iPad > LIBRARY > Music”. 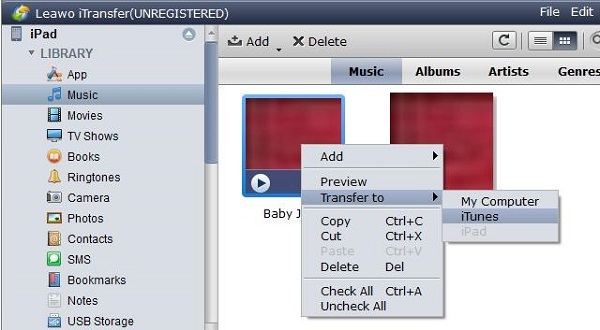 Select the music you would like to transfer or hold “Ctrl” to multiply select the items. Right-click on the selected ones to choose “Transfer to > iTunes”. You can also click the arrow below. In the pop-up window, check the box besides “Transfer to list” and choose “iTunes” in the pull-down menu. Then click “Transfer Now”. 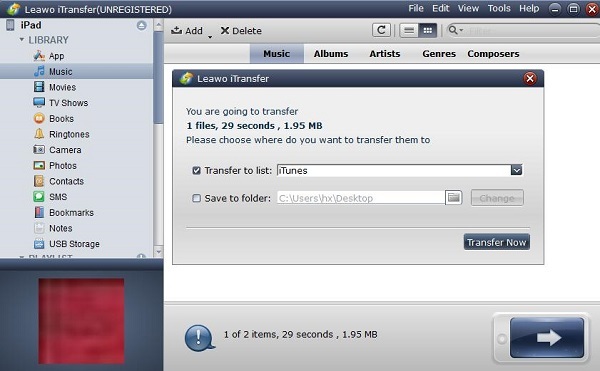 This is the way on how to transfer non-purchased items from iPad to iTunes via Leawo iTransfer. Just simply try out this powerful and user-friendly Leawo iTransfer to add an extra boost to your life. You will never regret coming across this article.